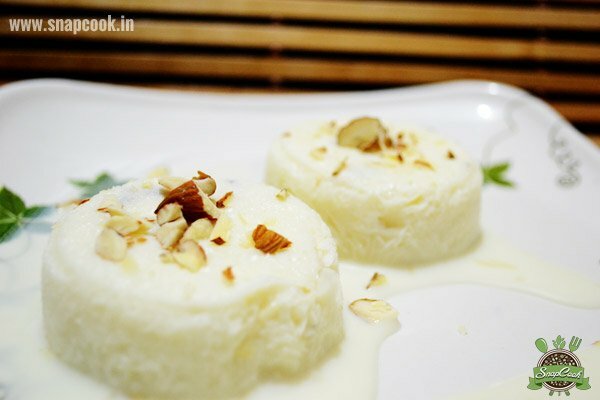 A smooth creamy lavish dessert flavoured with almonds. It is all season favourite street dessert.Now widely available in restaurants, food-courts, malls. Combine Full-fat milk, milk-maid and milk powder together in a pan and bring it to boil. Simmer for 10 minutes till the mixture thickens. Add cardamom powder and almonds to the mixture and turn the gas off. Allow the mixture to get cool on room temperature. Pour into kulfi moulds or the moulds of your choice. Freeze it for 7-8 hours in refrigerator. Remove from the refrigerator after freezing, unmould it and serve immediately. You can serve on plates and garnish with almonds or you can directly serve by inserting the stick or fork.